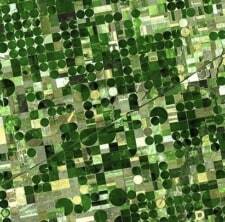 Kansas crops, seen from a satellite. Photo courtesy of NASA. 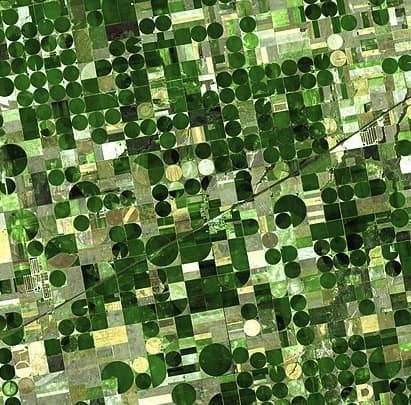 Forcing thousands of gallons of water per minute across a line, over dozens of acres to an irrigation pivot requires a powerful motor and high pressures. This causes wear and tear on equipment such as pumps, motors and lines, and can brown out the local electrical grid on startup. More and more farmers are turning to VFDs (variable frequency drives) as a solution to moderate the motor speed and slowly ramp up torque, while regulating pressure, preserving equipment and saving electricity. It’s not a storm in a teacup when lightening strikes an irrigation system; the electrical surge can overload sensitive components in the VFDs, such as control boards or input diodes. ACES has many years experience servicing these drives to get them quickly back up and running, and the water flowing once again to thirsty crops. We work on all makes and models from AC Tech to Vacon. Thanks to our specialized training as the only Yaskawa Authorized Service Provider in Kansas, we’re uniquely positioned to evaluate the damage, order parts overnight, quickly turn around the repairs and reinstall the drive. We have extensive experience working with AC, DC and VFD drives on a daily basis, and can typically receive authentic factory Yaskawa parts within 12-48 hours. If it’s important and your operation is down due to drive failure, call us and we’ll get it running again right away. Recently one of our customers experienced five lighting strikes to his irrigation system in less than a year. Our technician was able to rapidly restore function each time by swapping out a spare drive while bringing the damaged drive back for repair. In addition, ACES can install equipment to lessen your chance of damage from lightening strikes. If you have an irrigation pump VFD — or any kind of VFD — which is under the weather or could be taken out of service by a lightening strike, give us a shout for a free estimate. It’ll be smooth sailing before you know it.